5. Pay the initial entry fee of £150 plus VAT, as applicable, online. Second and subsequent entries can be made at a lower rate of £75 each + VAT. Charity/Not-for-Profit entries receive a 50% discount on the entry fees. 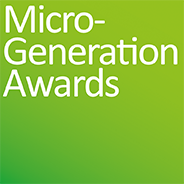 Please visit the USEFUL ADVICE page for further helpful guidance on preparing and submitting your entry for the Micro-Generation Awards. Eligibility: A company may enter the 2020 Awards if the entry submission covers the period from October 1, 2018 to March 31, 2020 – an eighteen-month period. Please remember, any relevant web and mobile sites must have been available, online, before midnight on March 31, 2019. THE DEADLINE FOR ENTRIES IS MARCH 31, 2020.